Dallen Medical, Inc., is replacing its Tensyn™ Band with the Tensyn Plug, claiming this to be the first adjustable orthopedic fixation device. The device has now been cleared for U.S. marketing under a new FDA 510(k). Dallen Medical Inc., is a frequent visitor to our pages with its developing array of orthopedic fixation devices. These include bands and staples for use in procedures as diverse as sternal closure through to syndesmosis repair. Now though the company is replacing its Tensyn Band with the Tensyn Plug, which it says improves upon its predecessor by offering a lower profile, knotless fixation implant. Dallen says the Tensyn Plug enables surgeons to easily adjust the implant prior to locking into place in order to achieve optimal reduction of the fracture. While competitive products require manipulation of multiple suture wires to “lock” into place and are not adjustable, the Tensyn Plug can be adjusted by simply loosening the screw cap and sliding the cap back before re-positioning and locking the screw cap. 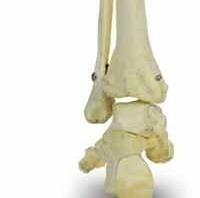 Designed for orthopedic surgeons and podiatrists, the Tensyn Plug is now cleared for syndesmosis, AC/CC joint stabilization, mid-foot (Lisfranc), lower foot, and wrist and hand repair. The device incorporates the company’s proprietary, Tensyn knotless banding technology for stabilized fixation of soft tissue in the extremities while allowing physiologically natural movement of those joints in a way that rigid screw fixation does not permit. Like the company’s Tensyn Band, the Tensyn Plug uses a wide suture band which distributes fixation forces more broadly than alternative products. This broader distribution of fixation pressure is claimed to be easier on the surgeon’s hands and, therefore, easier to “lock” into place. Other wire-like devices are significantly narrower, concentrating pressure on a focused area within the bone and potentially risking injury to a surgeon’s hands, says the company in what looks like a tilt at Arthrex with its TightRope offering.